I had some cottage cheese (paneer) sitting in the fridge. I know there are many ways one can use paneer, but I didn’t want to use it the conventional way… making a sandwich, palak paneer sabji or even in rice. 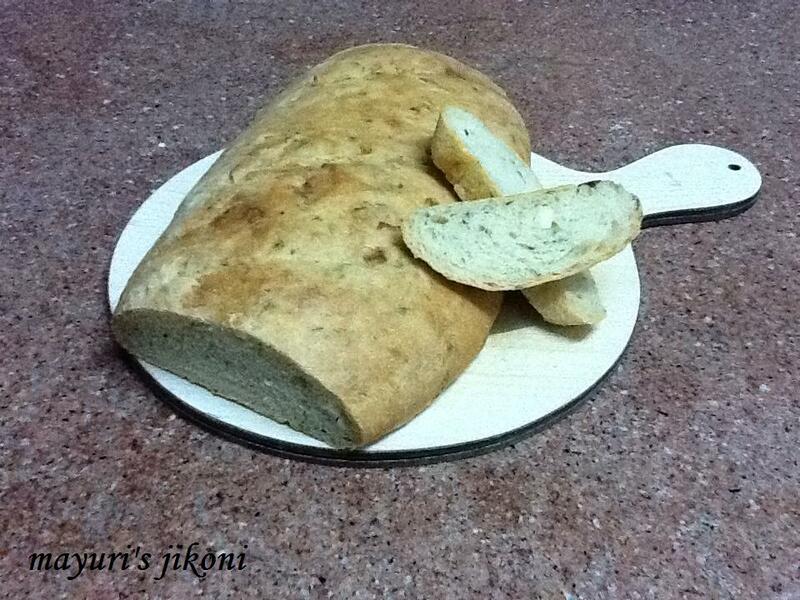 I decided to use it to make some bread. Most recipes of cottage cheese bread that I browsed through had eggs. However that did not stop me from making a slightly indianised version of the bread. I was pleased with the result. The whole idea of replacing some of the ingredients comes about when you cannot find the required ingredient. I couldn’t find any fresh dill at the market or at the greengrocers because it is really hot here. So jogged my memory and thought of other herbs. Some of you may think but she has already used coriander, rosemary, mixed herbs in the other bread recipes. So there staring right at my face was fenugreek. Yes fresh methi as we call it and I love the one grown locally in Mombasa because it does not taste very bitter. A bit of chopped fenugreek and cottage cheese added an interesting flavour to the bread. Sieve the flour into a big bowl. Add salt and sugar and mix it up. If you are using instant yeast add it to the flour and mix. If you are using dry active yeast which is not instant, sprinkle it over the warm water or whey. Add 1 tsp sugar from the measured sugar.Cover and let the yeast mixture become frothy. Rub the olive oil into the flour. Add the liquid to the flour and form a dough. Dust extra flour onto a board or work top and knead the dough. Knead the dough for ten minutes,using the heel of your palm or use a dough hook and knead it by machine. Oil the bowl. Form a nice round ball of the dough. Rub it with oil and place in the bowl. Cover with a cling film or plastic sheet and let the dough rise till it becomes double the size in a warm place. This will take about 2 to 3 hours. Knock down the risen dough gently with you knuckles. Add the cottage cheese and chopped fresh fenugreek. Knead the dough gently just enough to mix in the cottage cheese and fenugreek. Use extra flour or oil if required to knead. Shape the dough as you like, into a round ball, oval shape or use a loaf tin (9X5 inches). Place the shaped dough onto a greased baking tray or a greased tin. Brush the top with egg wash or milk. Return the shaped sough to a warm place and let it rise again till its nearly double the size. This will take about 1½ hours to 2 hours. Place the shaped dough into the oven and bake for 30 to 35 minutes till the top is golden brown. Knock the top of the bread to check if it is done. It should sound hollow. Remove the bread from the tray or tin and place it on a wire rack to cool. Slice when it is cold. Can make them into rolls. Add fresh dill instead of fenugreek. As soon as the loaf comes out of the oven, brush the top with butter if you like. Instead of milk or egg wash can brush the top with olive oil if you like. Whey is the water left over from hung yogurt.